I am experiencing something in my personal life right now that feels stressful to my body, my nervous system and my brain because I associate it with big fears. Old patterns of thinking loom large. Even though the truth is that things have changed, and even though the likelihood is strong there will come a positive outcome this time, still I find myself ruminating on what might go wrong. The light is here, and mornings begin much earlier than they did in March and April. The bird symphony starts around 3:30am out my now-open bedroom window, about the same time my brain starts racing over my situation. Chickadees, wrens, robins, jays, and even the occasional cackling crow do their best to sing up the sun. The urgency in their voices, the gusto they emit, makes me think they really do believe if they do not sing heartily enough that it will not rise. I notice they do not lay in bed thinking about the sun not rising, though. They get up, walk to a branch, and they sing. Lately I have been coming here in the early morning, to a new favorite bench in woods near my neighborhood, to begin the day. Walking here, breathing fresh oxygen straight out of new-leaf stomata, listening to birdsong and the rustle of wrens under sword ferns, I can consciously shift my brain patterns. I notice the closed circle of negative fear-based thinking, and breathe to invite a lighter motif of open curves, and possibilities I had not considered before. Creativity helps the transition. 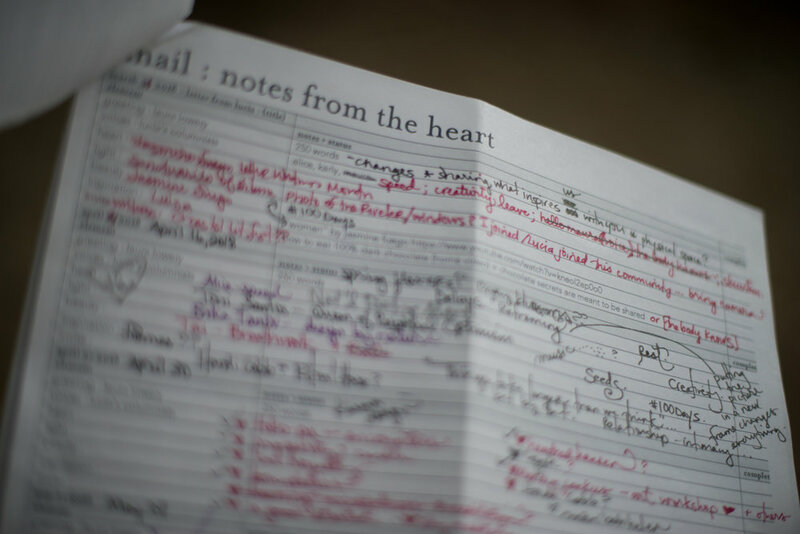 Writing words in a journal, reading messages from dear friends, mapping out my day in a notebook of good ideas, intention, and a liberal sprinkling of literal hearts drawn next to each one. The stressful things will all still be there, but somehow this morning ritual of creative breathing, walking, working, and writing in the woods gives me the opportunity to set my own desired course for how I will mentally and emotionally approach the day. It gives me power--the capacity to pause so I can respond to whatever unfolds, rather than react. Sometimes I sit cross-legged on this bench and meditate, eyes closed, breathing, taking in the sounds of nature mixed with the city machinery in the distance and nearby that is omnipresent in an urban place like Seattle. I marvel at how noisy humanity has become. I marvel at how gorgeous and rare silence truly is. I make a few more marks in my journal and watch a squirrel flirt with me from behind a tree trunk. Soon I stand, stretch my legs again, and walk home to begin the day. Have any new May morning rituals discovered you this year? What do you do when negative fear-based thoughts pop up with the early morning light?